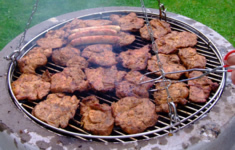 Beef received from our cattle is one of the best Polish cuisine cooking meats. It is delicate, marble-colored, perfectly suited for steaks. 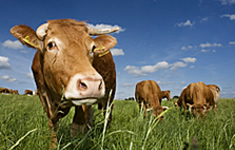 The animals from which the meat is derived are naturally fed and healthy. We sell calves of Charolaise and Limousine breeds, mostly young male bulls, between the ages of 7 to 8 months, with an average weight of 270 kg. Heifers are left for preservation of the herd. We offer high quality organic hay and silage, which contains grass (high and low), legumes such as white clover, red clover and lucerne. 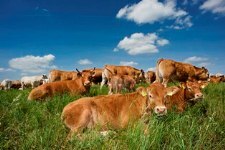 As the fertilizer for our fields we use manure produced by our cows and compost prepared from our own grasslands. Organic food has been tested over the years, so there is scientific evidence that it is healthier than conventional. It is produced without the use of synthetic fertilizers, pesticides, hormones, antibiotics or synthetic additives. Anyone who tasted a juicy beef steak knows that it is a meat with a unique taste. This is particularly true in case of meat races of cattle – their meat is so much tastier than the beef from the dairy breeds. Beef is a very universal meat. 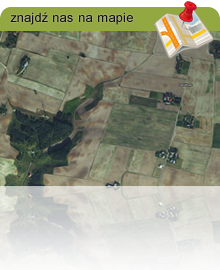 We are pleased to announce that on 05.11.12 we have launched new website of our farm in Pacółtowo. We hope that the new website will show you in a clear and attractive way our farm operations.